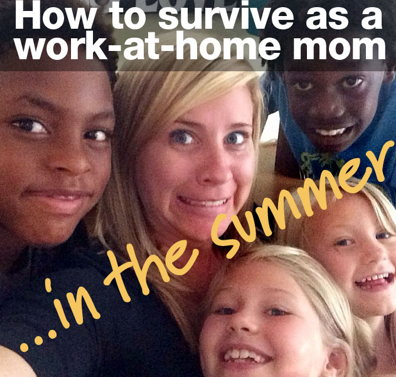 How to survive the summer as a work-at-home mom - Mom This! : Mom This! Kahil Gibran once suggested that joy and sorrow are inseparable. They arrive together, he wrote. “When one sits alone with you … remember that the other is asleep upon your bed.” I get it, man. You’re describing what summertime is to me. Growing up, summer was the best thing in the world, and I love revisiting that freedom and happiness when my kids are on their break. I get to spend more time with them. I get to see them play. I watch them grow and change before my eyes because they’re not at school all day. And then all that joy ends up sprawled out “asleep upon my bed.” And in my kitchen. And around my desk, where I have to Do Work. I work from home and can’t really take a three-month vacation from deadlines and writing and miscellaneous work responsibilities. Work-at-home moms (and dads) always have to balance the professional side of things with family responsibilities like playtime, snacks, argument-refereeing, and boredom-solving. Summer is our nemesis. What is a WAHM supposed to do? How do you get your work done and still make time to enjoy your kids and make the most of their summer vacation? Here are some options I’ve tried and/or am about to try … before I tear my hair out. Create a daily schedule for your family. Draw lines and make it clear: This is my schedule. This is when I am working. This is when I need to concentrate. Build your kids’ schedule around this so they know what to expect. Summer may mean you have to work irregular hours (early mornings or late nights). But remember: it’s only for a few weeks, and it may be the difference between keeping your professional life on-track or, you know, sticking your head into the blender because you can’t get anything done. End your day at a regular time. Kids need to know when you’re Working Mom and when you turn back into Mom. That helps them understand where they fit into your day. I’m considering some type of reward system for them when they’ve been quiet or have given me some distraction-free time. When they meet the requirements, we get to go to the beach or play a game or whatever they want. Of course, YOU have to stick to the rules, too. When scheduled work time is over, it’s really over. No going back to check email or finish something. Create rotations for your kids. Yes, like a Montessori school. Block out sections of their day, and give them a checklist. When they finish the checklist, they earn a reward like screen time. Let’s say they go through a rotation of reading books, practicing instruments, getting exercise or playing sports, and free play. Make it one they can follow along independently. This will serve to break their day up a bit. Despite how short your hours of work may seem to you, it’ll feel like FOREVER for your kids. While unstructured playtime is healthy, giving them a schedule of things they are expected to do also instills self-confidence and trust. They can look at their list, check things off, and feel proud of their accomplishments. Designate them their own lunchtime chefs. This is another way to build independence. Teach them how to make a sandwich. Keep lots of fruits and veggies on-hand. Shop for groceries with easy lunchtime ingredients in mind. Even better, create a chart to help them create a balanced meal for themselves. Have columns for a main dish they can choose (a sandwich, peanut butter or cheese and crackers, something filling and with protein). Have another column with fruit and vegetable options. You might also add an “extras” column that includes chips or cookies or not-so-healthy items (only one serving of these allowed). Guess what? Kids will almost always be happy with a lunch they prepare themselves. Make them clean up. They make the lunch, they clean up the lunch. You don’t want to end your workday by walking into a disaster zone of a kitchen. Show them how to scrape food scraps into the trash or compost bin. Teach them the basics of rinsing a plate and putting it in the dishwasher. Make them clean up their prep area and the table. If necessary, empower the older kids (or your most detail-oriented child) with the authority to make sure this is done properly. If it helps, this is another opportunity for reward when you finish working. The less you have to clean up, the more time you have to do something fun together. Build a moat. Not literally—talk about a mess—but do your best to create a kid-free workplace. Don’t float around the house with your laptop. Stick to one location, and make your kids obey your pre-set boundaries. They need to understand what IS work and what is not work. Close a door if you can. Or put in a pair of earbuds or headphones to drown out the noise. Kids really have no idea how loud they can be. Define what merits an interruption. Kids need to know what’s important enough to barge in on Mom during work time. See a cute butterfly? No need to tell Mom. See blood? I WANT TO KNOW. These rules will vary depending on the age of your kids, but as long as everyone understands what’s important and what’s not important, eventually they’ll stop trying to get your attention. This will help you decide whether you can keep your door open or closed during work hours. Consider childcare. Not everyone can afford this, of course. One idea I’ve considered is hiring a trusted, older neighbor-kid to be a “Mommy’s Helper.” Maybe someone middle school-age who can come over and play, keep the kids out of my hair for a few hours, and provide distraction and supervision while I’m at work. (The real gems can even clean up messes and break up arguments.) It’s a win-win. You can pay this kid less than a proper nanny, but they’re also getting valuable experience when maybe they aren’t quite ready to babysit on their own.